Artichokes are amongst the world’s oldest cultivated vegetables and are said to have their origins in Sicily. In season between March and June, they are a fantastic spring treat. The recipe below was recommended by Natoora and is perfect as an appetizer or, quartered, used to top pizzas and open-faced sandwiches – perfect for a delicious & healthy start in the week! Clean the artichokes by removing the outer leaves and cutting off the tops. Add the sliced lemon and thyme, plus two tbsp. of the oil to the boiling water. 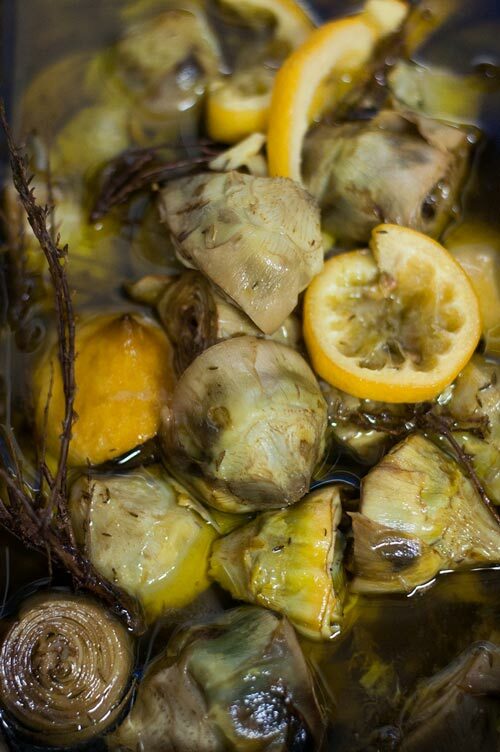 Allow boiling for five minutes, and then adding the artichokes. Reduce the heat, cover, and let simmer until the artichokes are very tender, about 20 minutes. Cover completely with the remaining olive oil before sealing the jar. Did you like the recipe? Tell us below! And, for the true flavours of Italy, why not join us on one of our inspiring Italian cooking holidays? To find out more click here or contact our fantastic travel team today!